Treat the cause, not the consequence! To whom is the procedure recommended? What is the main advantage of pressure therapy? 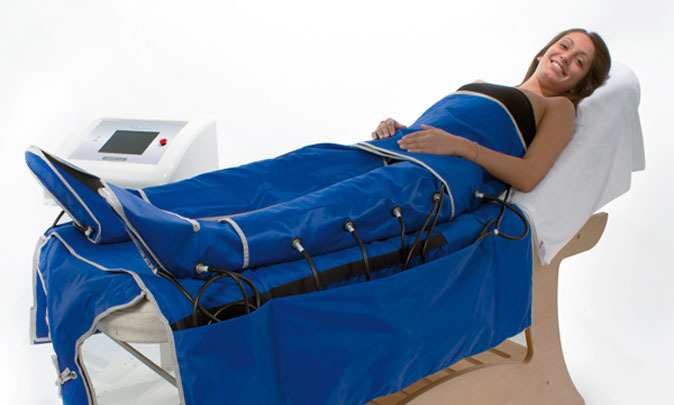 Pressotherapy has a mild and gentle effect on the body. Pressure therapy is safe even for those for whom electrophoresis, ultrasound therapy, electrical stimulation, or classic massages are contraindicated! 2-3-month-pregnant women can also undergo the procedure to remove swelling of legs. What is the course of pressotherapy? A special suit is put on the body’s problem areas, which is then filled with air from the machine. The air begins to pulsate… Muscles relax, blood vessels dilate… A powerful lymphatic drainage — i.e. acceleration of lymph circulation and withdrawal of excess fluid from the space between the body’s cells — occurs at the cellular level. Two microprocessors control the pressure on each body region, while you lie down and relax… Immediately after the procedure you will feel pleasant warmth and lightness! Price of a single procedure in our clinic is 1500 rubles. This is the average adequate price for Moscow (after all, we offer quality procedure performed using expensive equipment by a professional with extensive experience); it is not overestimated (we do not charge for the clinic status and “exclusiveness” of the procedures). Remember: you don’t get good pressotherapy on every street corner in Moscow — take reasonable approach when selecting a clinic! Book pressotherapy at LIPSCLINIC — you will be satisfied both with the process and the result! Dial 8 800 700-72-87 or leave a request to schedule a free consultation with our doctor.